Street eats need a side of pavement to taste better. 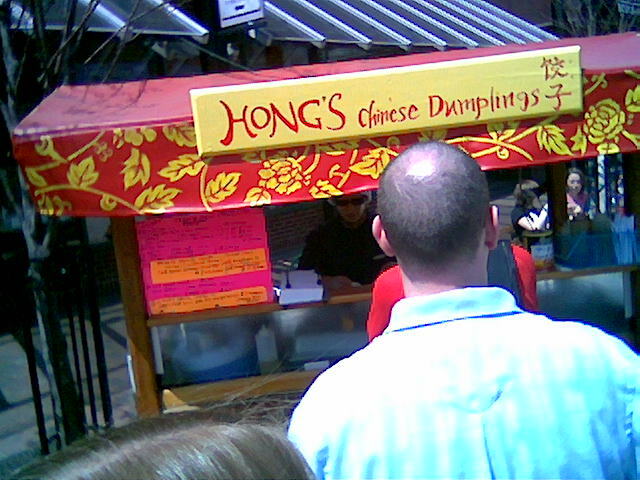 New to me is Hong’s Chinese Dumplings, these award winning dumplings, are yummy street fair. Note the line of people in the picture, even after 1pm, it’s common to find a line waiting for the dumplings. Hong’s is located, on the top half of Church Street in Burlington Vermont. The multicolored sesame seeds are visually awesome (cart grub with presentation!). The noodles are light on the peanut flavor, but work well with the fried egg, and sliced cucumber and carrots. The fried rice is surprisingly good, it doesn’t have the hot smoke oil flavor as you would straight out of a wok, but there are corn kernels, carrots and other veggies. You could eat this for lunch by itself. 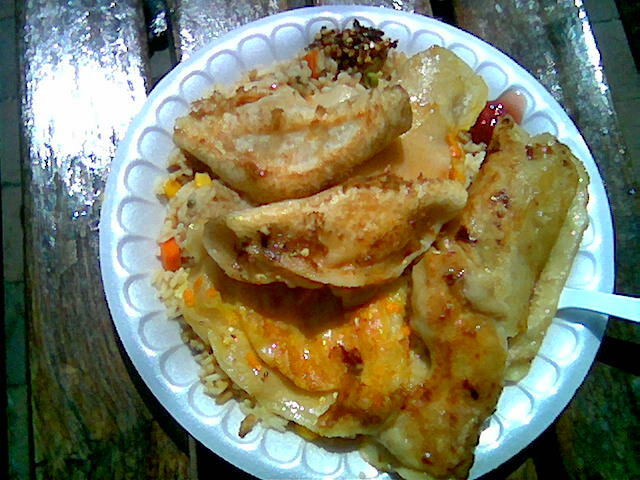 Both specials are $7; the noodle special include choice of three dumplings, and the rice special choice of six dumplings. 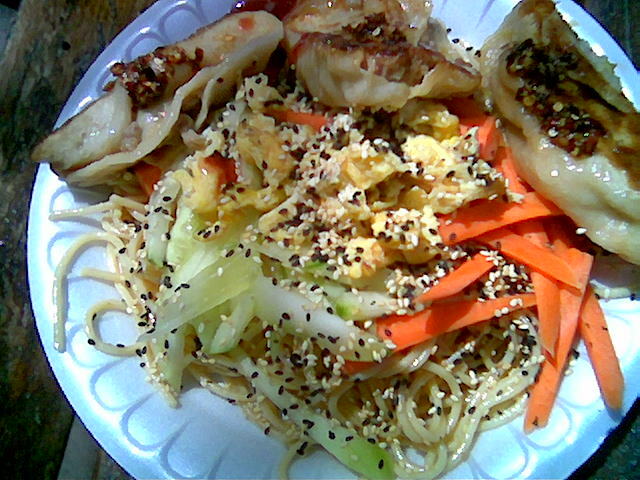 Dumpling options are: veggie (carrot and cabbage? ), chicken and pork, and finally crab and cream cheese. The crab is likely “crab stick“. I personally prefer the chicken and pork, with a couple veggie dumplings. I love when these pan fried dumplings are crispy, some dumplings come out a little too soft for my taste. I may try to ask for crispy dumplings next time. In addition to the yummy dumplings, there are an array of sauces to be had at the counter, which are needed to get the full effect. Beyond the soy-sauce, there is nice oil pepper concoction than can be spooned on, which besides heat adds crispness due to the pepper corns. There is a also a great sweet and sour sauce that has a little heat. Hong is constantly rolling the dough and cooking while she prepares you order, she’s an impressive multi-tasker. This entry was posted on May 15, 2008 at 12:22 pm and is filed under Uncategorized. You can follow any responses to this entry through the RSS 2.0 feed. You can leave a response, or trackback from your own site.